Sometimes it takes the expertise and guidance of a professional interior designer to complete your home design project. We are pleased to offer our comprehensive in-home design services. Our offerings encompass all aspects of your design plan from start to finish, whether it consists of only the window treatments or the overall design concept. We take the time to listen to your needs, examine your preferences and understand your unique individual style. Then our talented interior designers will create a multitude of scenarios for you to choose from, that will complement your home and provide a custom look that is uniquely yours. We take the stress out or your interior decorating experience! We offer literally thousands of fabrics, materials, colors and styles to choose from – in comfort of your own home. 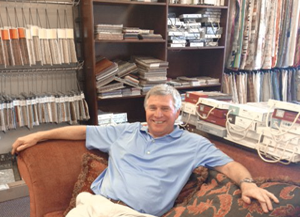 Blind & Drapery Showroom owner Roy Bates has been exceeding clients’ expectations for more than 20 years. We’re your interior design headquarters & one stop shop for window treatments, shutters, blinds, shades & drapery. We bring thousands of samples to your home – so you can match and compare your window treatment choices with your existing furnishings & decor. Then sit back & relax – leaving the measuring, ordering & installation to us! This ensures a perfect fit & quality installation every time. Not only are our prices lower & our quality better than big box stores – but our customer service is second to none! We handle your design project from start to finish . . . and because we’re local we are always just a phone call away if you ever need us. Call 818-598-0440 to schedule your free, in-home window treatment consultation. Our talented designers exclusively service the following areas: Agoura Hills, Calabasas, Westlake Village, Hidden Hills, Chatsworth, Camarillo, Malibu, Ventura, Topanga, Thousand Oaks, West Hills, Oak Park, Somis, Montecito, Carpinteria, Santa Barbara, Newbury Park, Moorpark, Simi Valley, Northridge & Port Hueneme.